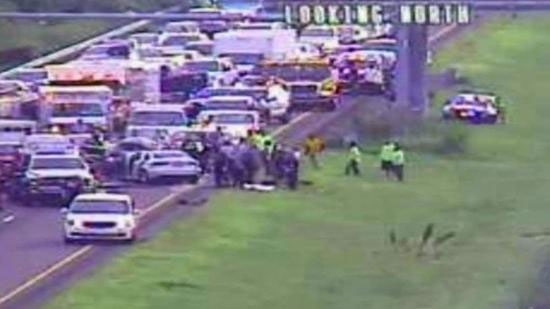 A car going the wrong way on I-95 in Northeast Philadelphia caused an accident killing two people on Sunday morning, 7/29. It happened just after 7 a.m. in the southbound lanes between the Route 63 West/Woodhaven Road and Academy Road/Linden Avenue exits. A Philadelphia man going the wrong way crashed head on with another vehicle from New York City. The driver who was going the wrong way was pronounced dead at the scene. A passenger in the other vehicle was also pronounced dead at the scene. The driver and another passenger in the vehicle that was struck were taken to the hospital. No word on their conditions. The interstate was closed for several hours as crews worked to clear the two-car accident. Pennsylvania State Police are investigating the crash. I-95 southbound reopened around Noon. A multi-vehicle accident caused one vehicle to crash into a home in West Philadelphia on Sunday afternoon, 7/29. It happened around 3:30 p.m. on the 6100 block of Ellsworth Street in the Cobbs Creek neighborhood. Two cars collided at the nearby intersection. One car was crushed and ended up hitting a parked pickup truck on the block. The other car, a red SUV, went flying over the front lawn of one home and crashed into the front enclosed porch of another. No one was home at the time. The two drivers were taken to the hospital. Their conditions have not been released. The crash remains under investigation. Philadelphia Police responded to a large fight involving teens in North Philadelphia on Sunday evening, 7/29. It happened around 7:30 p.m. in the area of North Broad Street and West Jefferson Street near the Progress Shopping Center close to Temple University. There were close to 200 juveniles in the crowd. They were fighting, disrupting traffic, and even damaged the window of a patrol car. Tables were overturned inside the Wendy's on Broad Street. No one was seriously injured and no arrests were made. Two teens were taken to the hospital with minor injuries.